Acclaimed by emergency care providers and outdoor enthusiasts worldwide (and even beyond the Earth, on NASA space shuttles), the SAM ® SPLINT is based on an ancient construction principle: curves are strong. The SAM ® SPLINT is built from a thin core of aluminium alloy, sandwiched between two layers of closed-cell foam. The SAM ® SPLINT is extremely pliable. Bent into any of three simple curves, it becomes extremely strong and supportive for any fractured or injured limb. 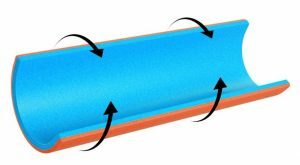 The reason lies in the physics of curved surfaces are strong; ”the same physics that allows skyscrapers and bridges to be built of I-beams and hollow columns rather than heavy steel pillars. A flat piece of sheet metal bends easily, but if you mould it into any of several structural curves, it becomes much more rigid. Many such curves are possible, but for splinting with the SAM® SPLINT, you need only three basic curves. With these, you can convert a simple SAM® SPLINT into something so strong that people have even used it as an emergency canoe paddle or snow shovel. The SAM splint is more than strong enough for any conceivable splinting need. 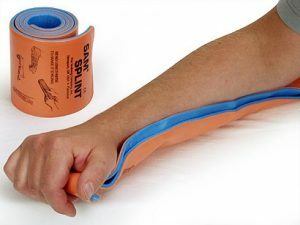 At the same time, the SAM® SPLINT is extremely mouldable, and soft enough to cut with ordinary household scissors. The result: with the proper choice of curves outlined in the training guide, almost any bone in the body can be splinted. It is even possible to use the SAM® SPLINT to create an emergency cervical collar for neck injuries. WHO USES THE SAM ® SPLINT?